An 88-year old died two days later from his injuries after he collided with a bus on at the junction of Upper Northam Road and Wildern Lane. Up to 40 children were forced to miss nursery today after their building was broken into and hundreds of pounds worth of damage caused. A boulder was thrown through patio doors at Busi Kids in Hedge End. Rooms were also trashed and items stolen. The nursery has re-opened this afternoon. An e-fit has been released following a robbery at a bank in Hedge End. 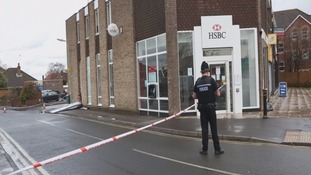 The image is of one of three men who drove into the side of HSBC on Wednesday morning. Police want to speak to this man and anyone who may recognise him. "If you recognise this man or think that you saw him in the area on the day of the robbery we want you to contact us. "You could hold vital information that could assist us with this investigation." Their homes were submerged in up to four feet of water, and for several hours, a housing estate in Hampshire turned into a lake. A burst water main was to blame in Hedge End. 17 homes around Old Shamblehurst Lane were flooded on Saturday morning. But the leak affected the supply of more than 20 thousand properties. Today, homeowners are assessing the damage and counting the cost - as Andrew Pate reports. Homeowners in Hedge End, Hampshire are assessing the damage caused by a burst water main, which turned a housing estate into a lake. Seventeen homes in and around Old Shamblehurst Lane were flooded on Saturday, with more than 20,000 houses in the area left without a water supply. Today the homeowners have been attempting to clear up. Fire crews from Southampton were called to Hedge End this morning after a lorry overturned. Hampshire children's hospice, Naomi House, has told ITV Meridian of its disappointment that the popular Greyhound Close Christmas lights display won't be going ahead this year. The charity has received around £45,000 from donations from the annual festive event in Hedge End in Hampshire. It has been cancelled due to an ongoing row with council chiefs about increased traffic and damage to grass verges.